One of the places near home that I have been exploring more deeply is Evergreen Lake. A summer's evening stroll near the water is delightful but trudging along the shoreline during a winter snowstorm is invigorating. Most people enjoy hiking on a warm, sunny day but I prefer being out in nature during a storm. The landscape becomes more interesting and trying to depict the weather effects convincingly becomes more challenging. First-hand knowledge of the subject clarifies the dramatic changes in line, color and perspective and it encourages the artist to create a more truthful expression of the scene. 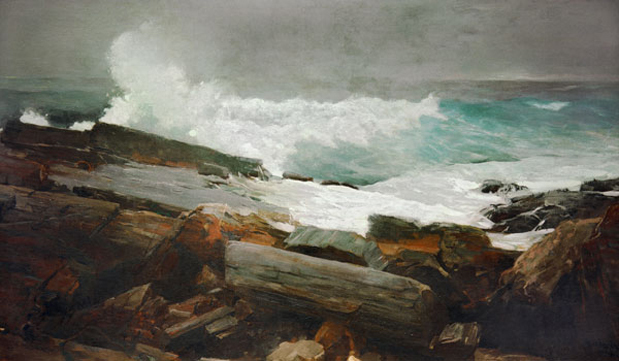 I've always admired the American artist Winslow Homer because of his relentless pursuit to capture the fleeting effects of stormy weather. Homer was most productive during his later years at Prouts Neck, Maine. Concealed in a studio by himself, just paces from the Atlantic Ocean, he constantly observed a narrow spit of land and watched as storm-churned seas pounded the rocky coastline. There is no doubt Homer's late masterpieces are a direct result of his close relationship with the sea and his immediate examination of the area in all types of meteorological conditions. Contemplating Evergreen Lake during the different seasons and in all kinds of weather has been a satisfying project. After countless visits, I've acquired an intimate understanding of our riparian ecosystem. I've begun to know the place by heart. I've discovered that a thorough study of your closest surroundings may reveal a deeper meaning for the simplest objects. Traveling to some exotic location to find inspiration is often marvelous and exciting but sometimes through the intense exploration of one's own backyard, you'll find plenty of artistic possibilities. Nice, thoughtfully written. Love the quote at the beginning. I also like the quote. I guess this post is kind of my interpretation of what he was saying. I enjoy spending time wandering around the lake observing all the goings on.